Here at the law office of Aundrea Stone Hanna, P.L.L.C., in Fort Smith, Arkansas, we want you to know that lawyers are real people too. We are compassionate and caring, and we want only what is best for our clients. 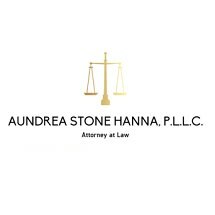 Having dealt with many of the same problems you face, attorney Aundrea Stone Hanna obtained her Juris Doctor from the University of Arkansas School of Law, and she established our law firm with a mission to deliver the quality, personalized counsel you deserve while aggressively advocating on your behalf to help increase your chances of obtaining the favorable outcomes you seek. You can rest easy knowing your case is in good hands, and you can trust us to relieve the burden you bear so that you can focus on more important matters in your life. For more information on how Aundrea Stone Hanna, P.L.L.C., can best serve your needs and help you secure a brighter, safer future for yourself and your loved ones, we invite you to contact our office to receive a free initial consultation regarding your matter.